Blue light is the type of light emitted from cell phones, tablets, and TVs. It can cause various problems for our bodies, affecting everything from our sleep patterns to our eyes. Yet, in a world where people spend large amounts of time staring at their screens for various reasons, it’s not surprising they’ll keep doing it no matter the harm. Thankfully, new technology can help negate some of blue light’s damaging effects. Carbonshade, a California-based startup, has created the so-called first fashionable blue light-blocking glasses, which the company says will “block the harmful blue and green light that prevents you from getting a good night’s sleep.” However, instead of using orange-tinted lenses, which are found on other versions of blue light-blocking eyewear, Carbonshade uses a red tint. Light waves fall into six categories: gamma rays, x-rays, ultraviolet (UV) rays, visible light, infrared light, and radio waves. It’s only visible light that (obviously) is visible to the human eyes. This type of light is made up of short, high-energy wavelengths approximately 380 and 500 nanometers long. These wavelengths have been found to be the most damaging to our eyes over long periods. 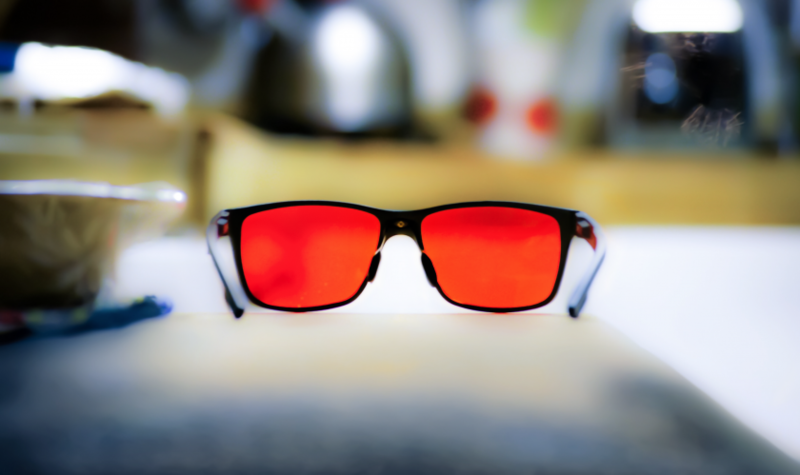 Carbonshade plans to launch a Kickstarter campaign for the glasses on Feb. 2 — they’ll be sold for $95 each. Maluf said early bird investors will get a discount, so be sure to follow Carbonshade on social media or sign up for its newsletter to get updates on the campaign.